While dating is always full of ups and downs, it doesn't generally involve training exercises, lengthy deployments and military lingo -- a foreign language if you don't do some research. Marines might have a reputation for being rough, tough fighters who are fiercely dedicated to their band of brothers, but each Marine also has his own individual personality. If you can focus on building a solid relationship, maintaining a connection with others and keeping your own needs in mind, you and your partner will be off to a good start. 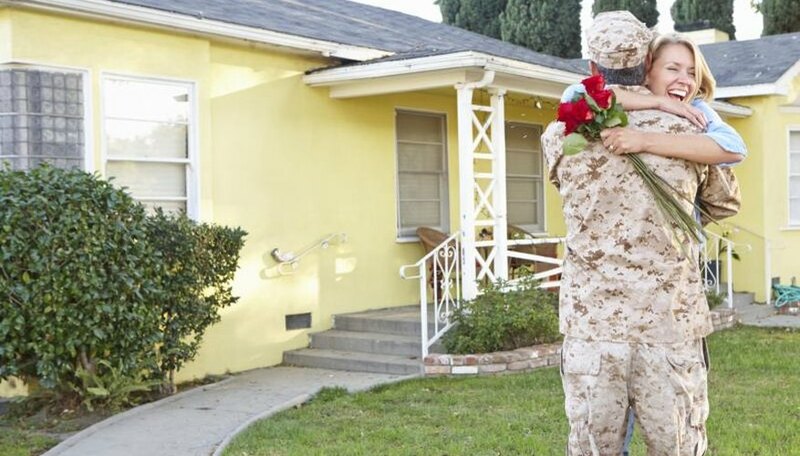 Marine embracing his girlfriend who is holding roses. Communication and trust are important in any romantic relationship, but due to lengthy separations and information that your Marine can’t share with you, they are paramount in a relationship with a Marine. Discuss areas of contention and relationship issues as they arise. Talk openly as much as possible, but remember that her work might entail information she can’t share. Be prepared for relationship stress before a deployment, which can lead to arguments and fights, cautions Lieutenant Colonel Simon Pincus and his colleagues in "The Emotional Cycle of Deployment: A Military Family Perspective." In an established Marine marriage, this stress and friction is often attributed to normal relationship ups and downs. However, when you’re dating a Marine, a fight or major blowout before deployment can seem to put the relationship on the rocks. You can help to reduce stress and fighting by talking about your mutual expectations for when your partner is away in areas such as independence and male-female relationships, advises Pincus. If you’re accustomed to spending all your time with your Marine when he’s home, when he’s on deployment you might suddenly find yourself with too many hours in a day. Make it through the weeks or months he’s away by maintaining your independence while he’s home, too. Pursue your own hobbies and interests, signing up for spinning classes, enrolling in a woodworking workshop or getting involved in volunteer opportunities. If you’re a stay-at-home wife or mom, consider pursuing a small business or working from home to provide you with a little disposable income and fill up your spare time. You can survive your Marine’s lengthy absences when you have a supportive group of friends and family to turn to for comfort and camaraderie. Stay in contact with your support group when your Marine is home and turn to others in similar situations through online support or groups on base. While Family Readiness Groups (FRGs) were once reserved for married spouses of Marines, these unit organizations provide a support network, family and holiday events and information while Marines are away on deployment and now welcome other forms of partners, too, explains a United States Army article "Family Readiness Group Defined." Spending months apart can be difficult on a relationship, but you can help to ease the strain by staying in touch while your partner is away. Talk on the phone or through video chat as much as possible. Exchange letters on a regular basis, keeping your partner involved in what’s going on at home and helping him stay connected to you. Send your love to your boyfriend while he’s away with care packages --you can even use them to show off how well you know him, too. Fill a care package with his favorite goodies and personal items. Add photos of you and the two of you together in photo albums, scrapbooks or on a coffee mug so he can share his morning with you. Faith, Rosenya. "How to Survive Dating a Marine." Dating Tips - Match.com, https://datingtips.match.com/survive-dating-marine-2123494.html. Accessed 19 April 2019.